The subject of waterproofing and rain gear is a highly technical one and usually elicits explanations only fit for scientists and engineers. The names of the fabrics and waterproofing chemicals used as well as the complicated brand names are enough to make anyone’s head swim. And all you really care about it which jacket is going to be the most comfortable and keep the rain out! 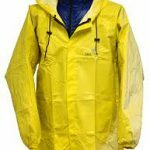 This article will try to break down the exact science of waterproofing into an easy to understand concept and process, one that will maybe even help you to decide what kind of rain gear is best for you. Fabrics that were both waterproof and breathable were introduced in 1978 using a lamination technique invented by Gore-Tex. Gore-Tex has since become known as the standard for waterproofing, much like Band-aid is often referred to instead of bandage, or Jell-O instead of gelatin. Gore-Tex invented a fabric that could both keep precipitation out as well as allow your body’s perspiration to leave, keeping you high and dry on both accounts and allowing you to maintain a healthy body temperature even during extreme weather conditions. Today, after many improvements to the original design, this is accomplished by using one of two highly effective fabric technologies called the laminate and the coating. The laminate works by bonding a waterproof membrane to the interior of a piece of fabric much like plastering wallpaper onto a wall, the wall being the fabric and the wallpaper being the laminate. The coating is more like simply painting the wall instead, using a liquid solution to provide the waterproof qualities of the fabric and smearing it on the inside of the garment like a coat of paint. The most common waterproofing technology, the laminate, can be made from a film of either polyurethane, expanded polytetrafluoroethylene (also known as PTFE), or simple polyester. Laminates made from polyurethane keep the garment lighter and easier to pack and are also able to accommodate excessive stretching or bending of the fabric without breaking open. Polyurethane laminates are also cheaper and thus better suited for the budget explorer. One disadvantage of polyurethane is that it breathes less than its alternative and may not be suitable for anyone with a tendency to perspire excessively. PTFE, one of the most used of all materials in waterproofing laminates, has the advantage of extreme breathe-ability. This drastically reduces condensation on the interior of the garment which may form from perspiration and cause chills. Although it doesn’t stretch very well and care must be taken with the fabric, garments made with a laminate of PTFE are well suited for rugged use and are made to withstand the most rigorous hikes in the most extreme weather patterns. Laminates made from polyester are rare simply because it was only recently discovered as a functional laminate material. The advantage to polyester is its extreme thinness which allows it to move vapor from moisture droplets out quickly. Polyester is known to stretch well and allow for comparably rough treatment of the fabric. Although polyester doesn’t breathe quite as well as its competitors, the difference is only slight. One main advantage of polyester laminates in waterproof fabrics is the ease with which they may be recycled. Once the waterproof garment has lived its life and become worn out by use, a polyester laminate may be recycled. This, however, is only possible if the rest of the garment is also easily recycled so care is being made to bond polyester laminates to fabric that is recyclable. Polyester is the most environmentally friendly laminate material. 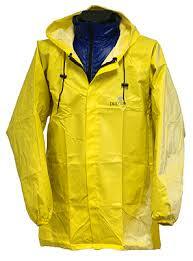 The outside of the waterproof garment is then given a special, durable water repellent finish. The exterior of most waterproofed fabrics are treated with this finish to ensure complete waterproofing. Its main purpose is to keep the fabric of the garment from any sensation of wetness that might weight it down slightly or cause discomfort to the wearer. This durable water repellent finish causes water to congregate into tiny water droplets and roll down the fabric much like it would off a duck’s back. The finish is specially designed not to inhibit the breathe-ability of the fabric in any way.